So like I made it to Revenge of the Fallen. Short Review: Giant Alien Robots beat the crap out each other. Having dialed the brain to mental age of 10, I went in to the movie expecting to enjoy robots bashing the crap out of each other. And that's exactly what I got. So it's win win in that regard. If you are not expecting Casablanca, you may like it. Other wise you'll call Micheal Bay a talentless hack (which he really isn't, he's not derivative, he clearly has his own unique style). The movie should actually be called The Attempted Revenge of the Fallen because it's a rule the Autobots never lose so therefore the villan must fail, and due to a ridiculous convoluted plot the Fallen failed. For me, it's about the robots and the small moments. Bumblebee's animations when reacting to Sam are fantastically done. The fist bumb of Mudflap and Skids was touching. Though most people will say they are the Jar Jar Binks of the movie, but I kind of liked their goofy slapstick. Perhaps only 10 year olds get it. 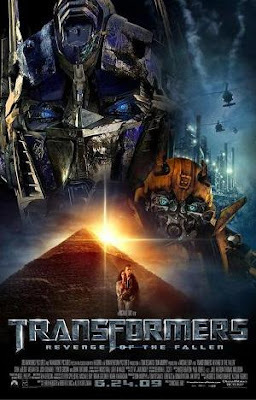 The scene where Optimus Prime takes on Megatron, Starscream and another decepticon I didn't recognise in a forest was a highlight of the movie. Starscream loosing an arm was cool and having to carry it with him and then being beaten with it by Megatron was classic transformers. Check your brain at the door. Here's some quotes from Revenge of the Fallen.